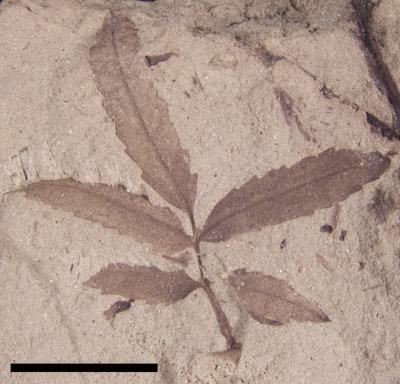 Selected Science News: CAN THE MORPHOLOGY OF FOSSIL LEAVES TELL US HOW EARLY FLOWERING PLANTS GREW? The authors first needed to assess whether aspects of leaf morphology in living plants today could accurately predict their life-history strategies. In previous research, Royer and colleagues had found that two simple measurements—petiole width and leaf area—could tell a lot about the ecophysiology of a plant. They found that the ratio of petiole width (squared) to leaf area is correlated to a leaf's dry mass per area. "While this doesn't tell us anything directly about the earliest angiosperms—the oldest angiosperm pollen is around 140 Ma old—the Albian marks the time when angiosperms begin to be very diverse and important ecologically," Royer concludes. "It is likely that explosive growth is one reason for the success of angiosperms."